Audience: Ages 4 to 8, though the text is longer than most storybooks for the lower end of the age range listed, and the picture book format may not immediately appeal to the upper end. This is one of those books which will benefit from enthusiastic marketing by a loving adult. 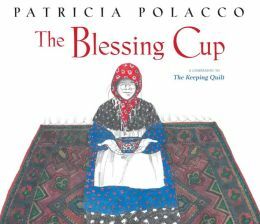 Summary: A companion to The Keeping Quilt, this narrative tells more of Polacco’s great-grandmother Anna’s life story. When the czar’s soldiers begin to drive the Jews out of Russia in the early 1900s, young Anna and her family pack a very few household goods and religious artifacts in their cart and set out on foot to start the long journey to America. Among their most prized possessions is a beautiful tea set which serves as a reminder of the blessings of family. Along the way the father of the family falls very ill from sleeping each night on the damp ground. A kind doctor takes the family in, nurses Papa back to health, and buys them all tickets for passage to America. In thanks the family leaves the tea set – all but one cup – with the doctor, assuring him that the tea set will continue to bless him, just as the one cup will do for them. Literary elements at work in the story: Perhaps the most interesting character in this narrative is the tea set itself. Polacco lifts it up first in the title of the book and then lets it shine in the illustrations, where Anna’s red kerchief and the blue and red tea set glow in the otherwise black and white pencil drawings. How does the perspective on gender/race/culture/economics/ability make a difference to the story? One of the main points of this story is that economic poverty does not automatically translate into spiritual poverty. Though Anna’s family has very little in the way of physical belongings, they are rich beyond measure in the things which matter: family, love, joy, God’s providence, etc. Theological conversation partners: An essential part of this family’s lore is that their tea set is magic. They tell and retell the words of the note which came with it as a wedding gift, “Anyone who drinks from it has a blessing from God. They will never know a day of hunger. Their lives will always have flavor. They will know love and joy … and they will never be poor.” Obviously, the magic lies in the gift of community, which grows when the family gathers around the tea set on the Sabbath and shares their meal together. The tea set mediates the sacred for this family just as the bread and wine bring us close to Jesus each time we take Communion. Anna’s mother proclaims the words of institution, in essence: “Pay attention! What we do here is important.” Just as with Communion, all who partake of the tea from the magic tea set become linked to Anna’s family. First the circle embraces the good doctor who heals Anna’s papa, and then all the generations which follow become part of the rich and loving community. This story might also be an interesting conversation partner with any of the stories in which Jesus turns the status quo upside down and inside out. (e.g., the story of the Good Samaritan in Luke 10 or the Beatitudes in Matthew 5:1-12) Anna’s family is incredibly wealthy, despite their physical poverty, because they have such love. When does Anna’s family use the blue and red tea set? What sort of magic does the tea set have? Why do you think that the good doctor was so kind to Anna’s family? Why do you think that Anna’s family left most of the tea set with the doctor when they left? Do we have any custom or ritual that we do in worship that has to do with eating and drinking? What do we remember when we eat the bread and drink the juice together? Name the people who used the blue and red tea set in this story. Who might use it in the future? Name some people who have gathered together for Communion in your church. Who might gather in the future? The Blessing Cup by Storypath is licensed under a Creative Commons Attribution-NonCommercial 4.0 International License.